Japanese Prime Minister Yoshihiko Noda and his election rivals are set to take part in a series of Google+ Hangouts on Friday with the aim of giving voters in the country a new level of access to top politicians. Each of the hangouts, which are part of a wider Google campaign to communicate details of the election, will last for 20 minutes. The politicians will each get their own broadcast, and will be joined by a moderator and five members of the public, who are selected based on questions they submit. A Google spokesperson told the Wall Street Journal that, as of Wednesday, the company had received more than 500 questions. The Hangouts among the features of the ‘Senkyo’ project to give the Japanese public greater access to election information and provide a platform for communication between politicians and voters. 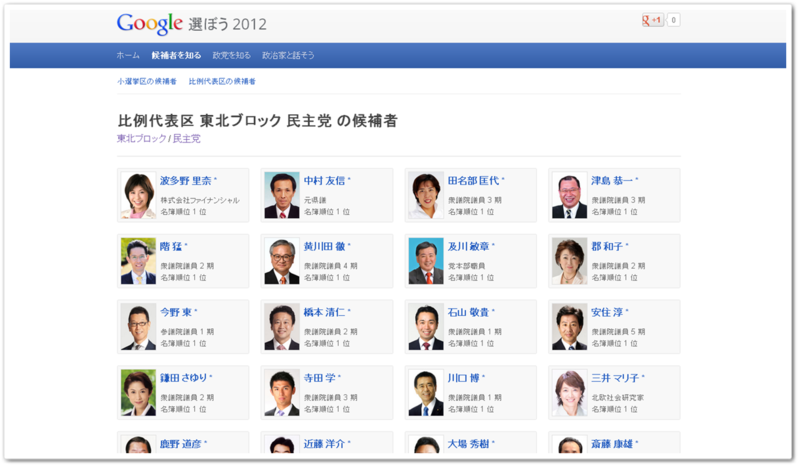 The Google election hub — google.co.jp/senkyo — contains information about each party and their candidates across every district and prefecture in the country. Recognizing that many voters will be using their smartphones to get access to information, the site has been fully optimized for smartphones and tablets. Voters will even be able to watch the Hangouts from their mobile devices. 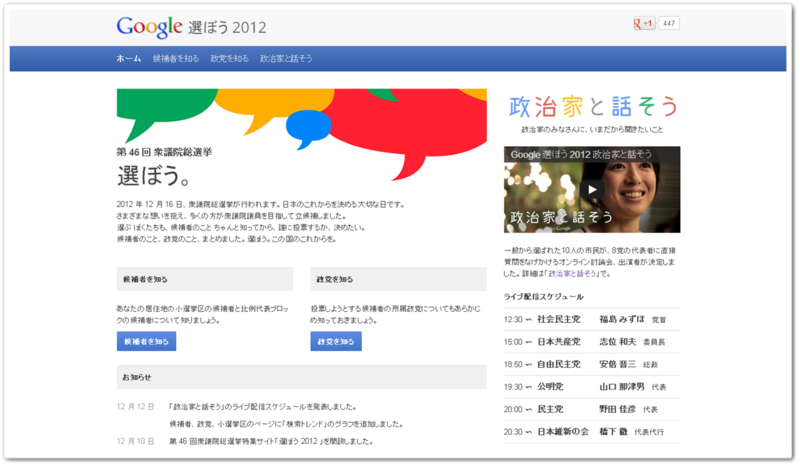 In addition to its Japan election hub, Google is encouraging Japanese interview users to discussion the election and key topics on Google+. Twitter is very much the de facto Web communications tool in Japan, so most of the conversation is happening there. 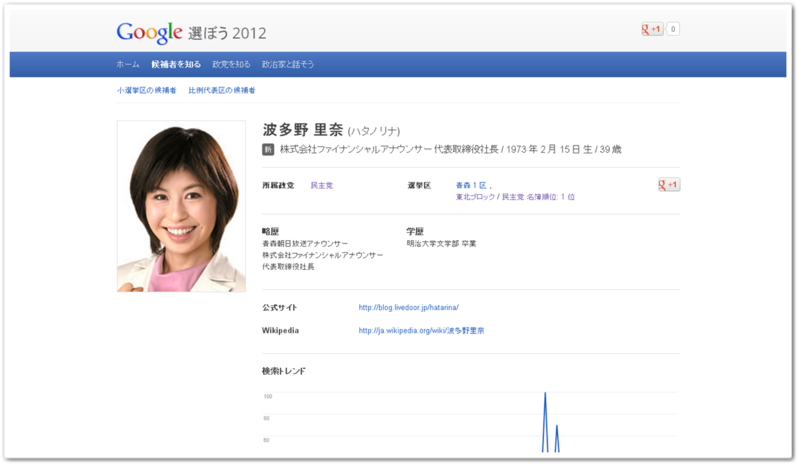 While these Hangouts are likely to help increase visibility of the service, it still remains to be seen whether Google+ can top Twitter in Japan. The dedicated election hashtag — #総選挙 (‘general election’) — has been established to get Japanese users talking about key issues. 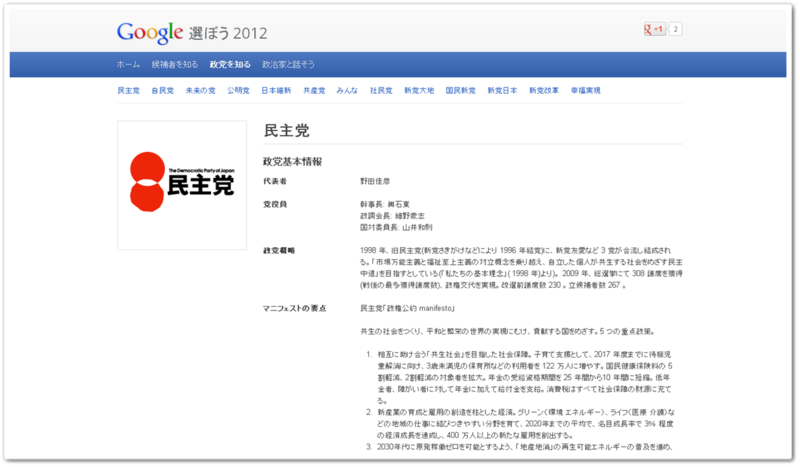 Google+ is using the #政治家と話そう (‘talk with politicians’) hashtag. As you can see from the gallery of screenshots further down, the site has a huge amount of data — both text and multimedia — about each candidate. For those with an understanding of Japanese, or a curiosity to see more, the video below has further details.